Close your eyes, and from the first tinkling piano and smoky brass notes in this show’s prologue, you are transported back to a different time and place: perhaps a dark backroom of a bar, in some down-and-out rural town, where people in the depths of the Depression have lost their hopes and dreams but still can get swept up in the story of an illicit love affair, of two rebels with a downtrodden origin story who still manage to give the finger to “the authority” in all its forms. This is the story of the criminal duo Bonnie and Clyde, who became sensational fodder for the day’s newspapers for a time thanks to their daring bank robberies, but who quickly became public enemy #1 when their escapades turned to murder. This original Broadway CD uses a wide variety of jazz, honky-tonk, country, and gospel styles to tell the story in a way that feels authentic to the time period. The historical parallels are there too, from Bonnie smuggling Clyde a gun to help break him out of jail in 1932, to sheriff’s deputy Ted Hinton’s unrequited crush on Bonnie – Ted eventually participated in the 1934 shootout that killed both criminals. In reading about the characters, I was also amused by the historically-accurate dress that Bonnie wears on the cover of the CD booklet, which then led me down the rabbit hole of the internet to the incredible collection of memorabilia and photos maintained here by some dedicated fan. 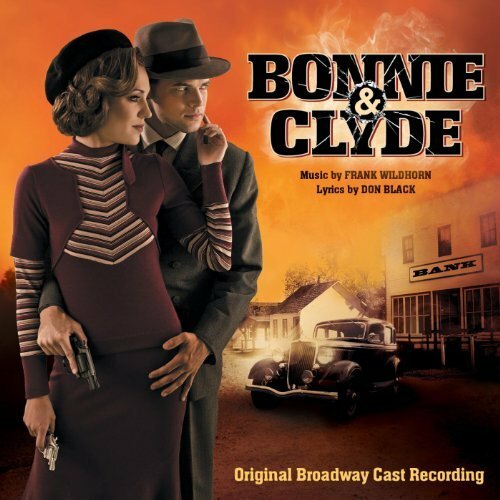 Indeed, the ill-fated pair’s enduring presence in pop culture in the decades since their death is an ironic parallel to the show’s opening, with a young Bonnie and Clyde both singing about how “This world will remember me!” Perhaps not in the way the young ones first intended, but this CD is evidence of that very remembrance.